Just one year ago, we were waiting with baited breath for the release of the first iPad, and fielding questions about what Apple's HTML5 video requirements meant for publishers and viewers alike. Here we are, a year later and there's already a new iPad 2 on the market before we could barely blink! Apple has defined the tablet market in the process, with lots of copy-cat competitors coming out with Android and other operating systems. Apple has sold nearly 15 million iPads in 2010 alone, and the iPad 2 is reported to have surpassed the 1 million mark in sales since it's release on March 11. So it's more important than ever before to be able to support HTML5 video so that viewers will have the same experience, no matter what device they are using to get to your website. Brightcove has been a leading voice in the market, making sense of the current state of standards and runtimes behind web video content. Jeremy Allaire's landmark post in TechCrunch outlined the future of web content and application runtime formats. 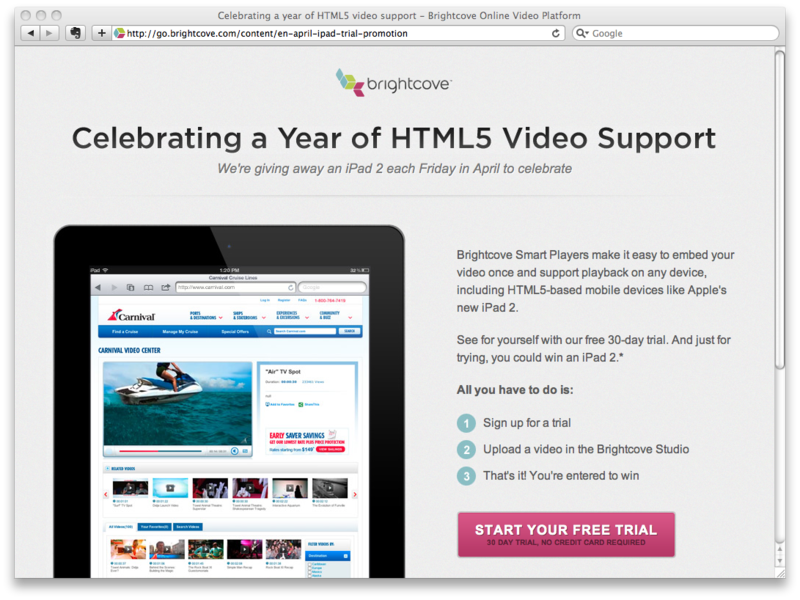 Jeff Whatcott wrote about The Present and Future of HTML5 Video Experiences while announcing the Brightcove Experience for HTML5 for mobile browser video experiences. We've continued to develop more advanced features for a still nascent standard. We've also dispelled some of the hype around the promises of the new standard in our HTML5 Facts & Fiction Whitepaper. Formats have only gotten more complex with the introduction of Google's WebM standard, and devices and operating systems keep getting more fragmented every day. When it comes to HTML5 video, we've always thought it important to talk about a complete HTML5 video experience, not only enabling basic playback, but covering everything that that is core and differentiating about using the Brightcove platform. That includes: branded playback environments, playlists, advertising, analytics, calls to action, social sharing, and multi-bitrate delivery.